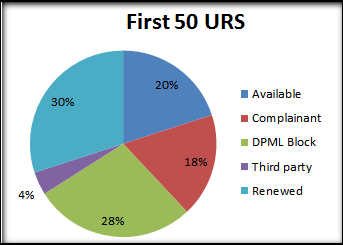 Uniform Rapid Suspension (URS) was introduced as an alternative to Uniform Domain-Name Dispute-Resolution Policy (URDP) when new top level domain names were introduced. URS is a faster, cheaper version of UDRP. A big difference is what happens when a Complainant wins. In the case of a URS, the domain name is merely suspended instead of being transferred to the complainant like it is in a UDRP. I analyzed the first 50 domain names that were suspended under URS at National Arbitration Forum to see what happened to them after they expired. Let’s get the easy ones out of the way first. 14 of the domain names expired and now have Donuts’ DPML service which blocks them from registration. This makes sense; these first domain names were a wake-up call to brand owners that they need to have a new TLD strategy. Examples include IBM.guru, Accenture.ventures and Lufthansa.company. 10 domain names have expired and become available. Examples include Lipitor.guru, RipOffReport.link and VirginAustralia.holdings. 9 domain names were registered by the complainant after the registrations lapsed. Examples include Spanx.clothing, Telepizza.menu and Netflix.buzz. 2 domain names were registered by another party after the domain expired. This doesn’t necessarily mean a cybersquatter later registered the domain. For example, Watson.company was registered by someone whose last name is Watson. Here’s where things get interesting. The most common thing that happened to these first 50 domains is that they were renewed. Twice. And they still show the original owner who lost the URS in Whois. This means that domain names suspended over two years ago shouldn’t still be registered to the original registrant. I reached out to several of the people who lost URS cases. One of them responded, and he told me that he hasn’t renewed the domain name. So I turned to registries and registrars to figure out what’s happening. It seems that the way URS works doesn’t fit into any existing automated procedures. It’s manual and requires a lot of human intervention, including when it comes time for renewal/expiration. That human intervention can be a problem, especially when you’re talking about the uncommon case of URS suspensions. In some cases, the domain name registrar might have overlooked a manual process, and in others the registry did. Of course, the complainants in these cases still win if the domain gets renewed while it’s suspended. Their goal was merely to suspend the domain, not get ownership of it. © DomainNameWire.com 2016. This is copyrighted content. Domain Name Wire full-text RSS feeds are made available for personal use only, and may not be published on any site without permission. If you see this message on a website, contact copyright (at) domainnamewire.com. The post A strange thing is happening to domain names suspended in URS appeared first on Domain Name Wire | Domain Name News & Views.